SINGAPORE — March 2016 — GKG Asia Pte Ltd, a leading supplier of fully automatic vision printers, and Juki Automation Systems (JAS), Inc., a world-leading provider of automated assembly products and systems and part of Juki Corporation, today announced that it awarded Horizon Sales ‘2015 Representative of the Year for GKG Printer Sales’ and MarTec, Inc. ‘2015 Representative of the Year for JT Oven Sales’. 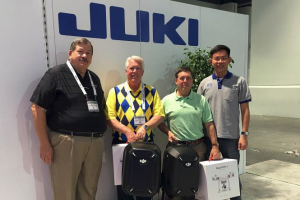 Jack Wong, Business Director at GKG, and Bob Black, President and CEO of JAS, Inc., presented the awards to Dave Trail, President of Horizon Sales, and Bill Harp, President of MarTec, Inc. during the recent IPC APEX EXPO at the Las Vegas Convention Center. Horizon Sales was selected for the award in recognition of the company’s sales in the mid-western states of: Michigan, Ohio, Indiana, Kentucky, Western Pennsylvania, Illinois, Eastern Iowa and Wisconsin. Horizon Industrial Systems, Inc. (DBA Horizon Sales) was incorporated in January 1992. The company takes great pride in its ability to maintain a strong customer base as a well as the stability and longevity of its core product lines. For more information about Horizon Sale’s products and services, contact Dave Trail, Principal, at 800-234-8688 or visit www.horizonsales.com. MarTec was selected for its sales throughout Alabama, Georgia, Mississippi and Tennessee. Since 1978, MarTec has been providing quality sales and service to the printed circuit board (PCB) manufacturing industry that is second to none. The company represents some of the best known brands in the industry. For more information about MarTec’s products and services, call (256) 536-1571 or visit www.martecincorporated.com. For more information about GKG Asia, visit www.gkgasia.com.